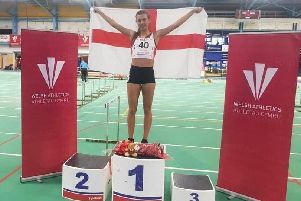 Alicia Barrett (Chesterfield) was second in the 100 metres hurdles at the European Junior Championships held at Grossetto, Italy over the weekend. Barrett clocked 13.28 behind winner Solene Ndame (France) who ran a personal best of 13.15. It was always likely to be a clash between the two. Ndame had beaten Barrett in th e heat. In the semi final they were in different races with Barrett being the overall fastest. Barrett, a student at Sheffield Hallam University, was hampered by a tight hamstring but it was a great performance by the 19-year-old. Her twin sister Ella was in the British quartet which reached the final of the 4 by 400 metres relay. Earlier in the meeting James Gormley (City of Sheffield and Dearne), well below his best, was eliminated in the heats of the 1500 metres.